The students at Arkansas State University-Beebe selected the 2018 Harvest Queen and Harvest King during the annual Harvest Social held October 24 at the Dr. Eugene McKay Student Center. With the theme of Instagrammys, students paid tribute to over 70 years of ASU-Beebe Harvest Royalty. 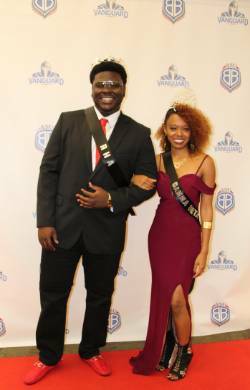 Sarah Turner was chosen as harvest Queen and Laquivius Jackson was crowned Harvest King at the 2018 Harvest Social. 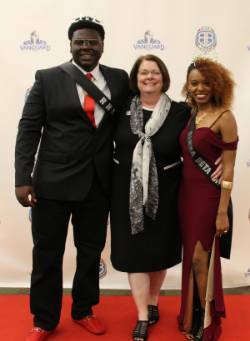 Dr. Jennifer Methvin, Chancellor, congratulates Sarah Turner on being crowned Harvest Queen and Laquivius Jackson, who was crowned Harvest King at the 2018 Harvest Social. Sarah Turner, a physics major from Little Rock, was crowned as the 2018 Harvest Queen, and Laquivius Jackson, a graphic design major from Cotton Plant, was crowned as the 2018 Harvest King. Harvest Queen nominees included Charsalyn “CeCee” Stokes, a Pharmacy Technician major from Blytheville; Caitlyn Crain, an education major from Haskell; Emmalee Heffner, a business major from Romance; Sarah Turner, a physics major from Little Rock; Lindsey Adkins, a business and Education major from Bald Knob; Tracy Mullen, a General Studies major from Searcy; Brittney Reed, a Fine Arts Theater major from Judsonia; Graycen M. Shaw, a business major from Carlisle; Patience Sullivan, a Criminal Justice major from Judsonia; Makala Summons, a business major from Jacksonville; Kristen Torres, an Early Childhood education major from Judsonia; Natalie Kirk, a Criminal Justice major from Lonoke; Morgan Seymore, an Agriculture Education major from Beebe; and Cara Sevier, a Practical Nursing major from Searcy. Harvest King nominees included Justin Cheatham, a Psychology major from Cabot; Myles Meldrum, a Criminal Justice major from Little Rock; Laquivius Jackson, a Graphic Design major from Cotton Plant; Andrew Melsen, an animal science major from Wilsonville, AL; Kenvonte “Rudy” Jackson, an Agriculture Equipment Technology major from West Helena; James Pendergrass, an Agriculture Equipment Technology major from Doniphan, MO; Hunter Wilson, an Agriculture Equipment Technology major from Farmerville, LA; Jacob Wicker, an Agriculture Equipment Technology major from Pocahontas; Jermi Buchanan, a Practical Nursing major from North Little Rock; Hunter Medlock, a psychology major from Cabot; Matt Sparks, an Applied Sciences major from Cabot; Nicholas Arnold, an education major from Rose Bud. For more information about ASU-Beebe and its programs, call (501) 882-3600, or visit the ASU-Beebe website at www.asub.edu.